Can they all be "The Toughest"
Marketing is a wonderful thing, especially when there is a battle of image. Did you know that the 2012 Tour of Utah, the oldest American stage race, is now referring to itself as "America's toughest stage race"? Last year the USA Pro Challenge was "America's toughest stage race," they still claim this title. They also claim they are "one of the largest professional cycling races in the United States." Meanwhile the Amgen Tour of California has become "America's most successful cycling race." A nice way to convey tradition and stability. RadioShack Nissan Trek just announced their roster! Jens Voigt is coming! 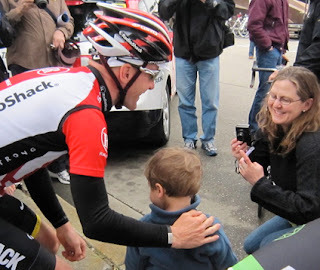 Levi Leipheimer is an unknown Update 05/11/12 3:08pm: Levi will race! Levi is still deciding whether he can ride. Levi Leipheimer was injured when hit by a car one day prior to his planned start at Vuelta al Pais Vasco, in the Basque Country of Spain. He fractured his fibula on April 1st. Fractures typically take 6-weeks to heal. You can uarantee Levi's doctor, PT, and Levi himself are busy doing everything possible to get Levi onto the roster of his team Omega Pharma-Quickstep for 2012, but it is unknown as of today. The tour begins in 4 days. Sadly Levi's home town is Santa Rosa, California - the host city of the start of the 2012 Amgen Tour of California. Levi Leipheimer has won Amgen Tour of California 3 times before (2007, 2008, 2009), came in 3rd in 2010 and 2nd in 2011. He is a fixture of the race, I hope Levi will be able to race or he will be greatly missed. I am betting Levi will be there, I hope he will be there to race. Levi has done much to promote cycling in the United States, and has the 2012 USA Pro Cycling Challenge in Colorado in August to look forward to. He recently made 2 spotlight videos for the Colorado tour, see Levi behind the scenes: Levi Leipheimer 's Life off the Bike (part 1), Levi Leipheimer 's Life off the Bike (part 2). Levi tweeted this photo yesterday of his team enjoying a meal together at Riviera Restorante in Santa Rosa, a hint at who will be on the team's roster. And yes, that is the THE Tom Boonen at the dinner table. Everyone, every parent should bring their children and themselves out to see an icon of modern professional cycling, currently ranked the #1 rider in the World - former World Champion Tom Boonen, is a Belgian racing in California! One of my favorite teams with my pick for the overall podium in 2012 - Tejay van Garderen, along with a crowd favorite - George Hincapie, have both been confirmed for 2012, also Chris Horner, and Jens Voigt. Which American tour is the toughest? We'll have to wait for a summary of elevation gain to determine the winner. Carmichael Training is sending a guided tour group out on each of these tours to ride every stage before the pros. Perhaps we'll get elevation profile totals from their group or from STRAVA.